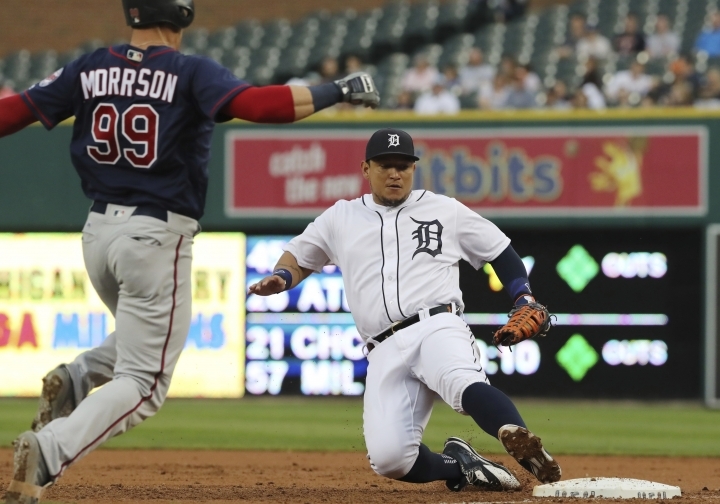 DETROIT — Miguel Cabrera ruptured his left biceps tendon Tuesday night, an injury that will sideline the slugger for the rest of the season, and the Detroit Tigers lost 6-4 to the Minnesota Twins. OAKLAND, Calif. — Evan Gattis hit a three-run homer and drove in five runs, Carlos Correa returned from a four-game absence and homered on the first pitch he saw, and the Astros earned their sixth straight win. SEATTLE — Mitch Haniger and Ryon Healy each homered twice as the first-place Mariners shook off two homers by Mike Trout for the second consecutive night. LOS ANGELES — Joc Pederson, Max Muncy and Yasiel Puig homered off Bartolo Colon, sending the Dodgers to the victory. NEW YORK — Didi Gregorius homered twice for New York, Washington slugger Bryce Harper left in the eighth inning after he was hit by a pitch for the second time, and the Yankees earned their 10th win in 12 games. MILWAUKEE — Chase Anderson pitched seven innings of one-hit ball, and the Brewers moved back into first in the NL Central. BALTIMORE — Home runs by Rafael Devers and Andrew Benintendi helped Eduardo Rodriguez win his fifth straight start, and Boston extended Baltimore's losing streak to six games. CHICAGO — Yoan Moncada and Yolmer Sanchez homered to lead off Chicago's three-run first, and James Shields won for the first time since opening day. PHILADELPHIA — Aaron Nola struck out 10 in another dominant performance and Scott Kingery hit a three-run homer, leading Philadelphia to the win. ATLANTA — Ozzie Albies hit a grand slam and Freddie Freeman homered during Atlanta's six-run sixth inning. PHOENIX — Jon Jay got his first three hits for Arizona, including a three-run homer, and the Diamondbacks won their fifth game in a row with a sloppy victory over Pittsburgh. Nine of the runs were unearned. Jay, acquired Thursday in a trade with Kansas City, was hitless in 12 at-bats for the Diamondbacks before his leadoff single in Arizona's six-run first inning. His opposite-field homer in the eighth broke the game open after the Pirates had rallied from an 8-0 deficit to trail 10-8. Starling Marte hit a three-run homer, doubled and made a diving grab in center field for the Pirates. Fernando Salas (4-4) got the win. The Diamondbacks have scored 51 runs in the last five games. They've won 11 of 14 and lead the NL West by three games over the surging Dodgers. The Pirates have lost six of eight. Arizona jumped on Trevor Williams (5-4) in the first with six runs, two on Ketel Marte's seventh triple. Five runs were unearned thanks to three Pirates errors, two on one play. ST. PETERSBURG, Fla. — Wilson Ramos homered, and six Tampa Bay relievers combined for a five-hitter. MIAMI — Trevor Richards pitched six effective innings for his first major league win, helping the Marlins top the Giants. ST. LOUIS — Eric Hosmer homered for San Diego, and the Padres carried a perfect game into the sixth inning of their 10th win in 14 games. KANSAS CITY, Mo. — Joey Votto hit a bases-loaded triple for Cincinnati in the 10th inning after Billy Hamilton slipped out of a rundown.